We have seen the rise of beauty boxes and bags in recent years. If you didn't know, a beauty box is basically a box with monthly subscription that contains awesome samples, and sometimes full-sized products, of your favourite brands. The items can range from cosmetics to skin care to hair and body care. The fun part? You won't know what are the mystery items you will receive until you receive it. Surprise! BUT.. Have you heard of a fashion box? When I first heard about the launch of Fashion Culture Box, I was thrilled because fashion is so my thing! Fashion Culture Box works the same way as a beauty box. They offer THREE uniquely different themes to choose from each month, where suscribers receive fashion AND beauty items that are specially curated by the FCB team. Usually they give out accessories, but sometimes the box consists of shades, scarves and even bags too! For RM50, it's soooo worth it. The boxes are usually sent out in the middle of each month. Imagine waking up to a pretty parcel at your doorstep every month! Fashion Culture Box offers an experience to remember with its tagliine "Look. Touch. Feel. And Experiment with Style". I was asked if I would prefer the June boxes or the July Boxes and I chose the Inspired by Music: Love Story theme in July as I find that it suits me more. Because it's a mystery box, you have to be mentally prepared to like or dislike some of the themes/ items provided..
Elegantly wrapped in black & white design, it's enough to delight any girl's heart. I especially love the logo, it kinda reminds me of Juicy Couture! Carefully nestled in the box are my goodies of the month! :D The accessories are wrapped nicely in plastic bags for added protection. 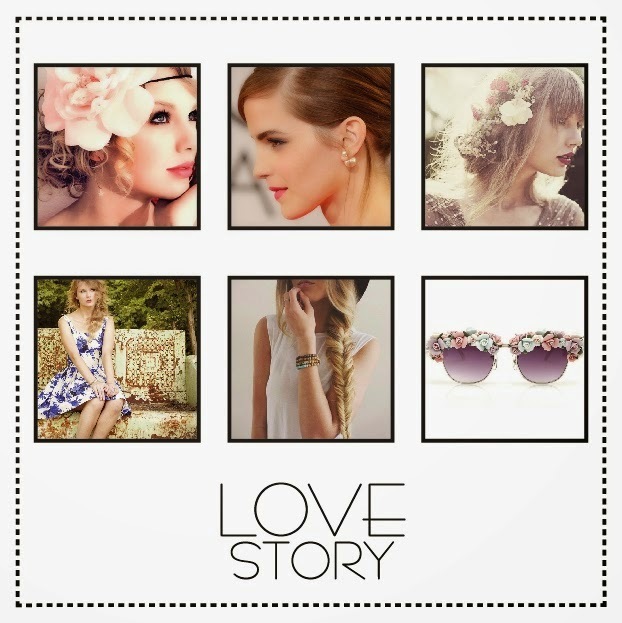 The Love Story fashion box represents the romantic soul. With soft and light colours, delicate and dainty motifs inspired by love on your accessories, you will fall in love all over again. The Lova Rosa Sunglasses is the star pick of the month! It's also my favourite item because of the beautiful floral design on the frame and on the sides. The gold sides just adds that extra touch of elegance to the sunglasses. Don't you think these are perfect for the beach or an outdoor concert? It's definitely a unique piece that will make you stand out from a crowd! The Mise en Dior Pearl Earrings are another favourite of mine. I've been seeing these around a lot lately, and I'm proud to own a pair! They're the same earrings that Emma Watson wore :D The elegant pearls with a touch of gold is perfect for a romantic dinner with your loved one. Beauty products will be included in every box too and this time I got these Shokubutsu Shower Foam samples to try out! The names itself makes me feel like I'm in a spa already. Last but not least, I got this Genesis Pro Gum Care toothpaste (120g). It has unique abrasive-free microscopic bubbles to allow greater surface contact with your teeth yet effectively penetrates the gaps between the teeth for better cleansing. Overall, I'm quite pleased with the box despite the little surprises. I think they usually include a copy of FCZine magazine each month but it seems to be missing for the July box. However, I think the items are true to its theme and definitely portray a lovey dovey image. I bet the sunglasses alone would've costed a lot more but the whole box is only for RM50! If you're a person who loves surprises, do have some fun and get a mystery box each month. Or boys, you could get this for your friends/ girlfriends! Because it's Friday, I took the chance to sync this post with my weekly Carinn x OOTD posts. Sorry for missing it last week, here's a longer post with extra bonus to make up for it - an outfit featuring FCB accessories! I decided to go for a bright, happy outfit. This look is inspired by Love at First Sight, where he takes one look at you and falls instantly in love with your cheerful personality and outfit. :) Dreamy, fun and flirtatious, it's something suitable for your first date! Have you subscribed to your Fashion Culture Box yet? If not, do it now at their website and like them on Facebook for sneak peaks of each month's theme. There are boxes on sale and if you subscribe for 3 months and more, you can get it at an even cheaper price! Themes for August box includes Wild City Life, Cruise Diva and Hippies Movement. I'm tempted to get one myself! Hurry up and subscribe as the subscription ends TODAY! September boxes are out too! Here's a sneak peak of the themes. Judging from the price, I guess the first two themes would offer more luxurious pieces? :D Oh yea, remember to use my Referral Code FCB-RINN-0770 for 10% off all themes + FREE shipping! If you like my look, do hype me on Lookbook will ya? Have a happy Friday with the ones you love! Disclaimer: The items may be sponsored but the review based on my honest thoughts and experience after trying out the products and services. I like the bracelet better than the gold necklace. And the sunglasses you got is a little different from mine. Yours unique! But the shade doesn't really protect you from the sun, just as a prop for photo shooting would be fine. I like it too, too bad it's just too loose for me. Shall we swap? HAHAHA XD Ooh, hope to see your sunglasses too! And you're right, it's perfect for photos but doesn't have the necessary UV protection :) Ah well, girls just love pretty things right? You look great in that dress and heels! Awww your skin is soooo smooth and lovely, I'm so so jelly. What's your routine? And as for the box, it's so cute that they gave you sun glasses and accessories hehehe, looking into how I can get one now. Love your look and your blog girl, please keep in touch! !